Higher education expansion throughout the Asia Pacific region leads to multiple growth opportunities and challenges at local, national, regional, and global levels. Proactive policy initiatives that strive to increase access to the masses are automatically faced with several social justice issues, including equity, efficiency, and choice. Ultimately, the ability of higher education graduates to perform well in industry is a key to measuring the quality of their higher education experience. Too often the preparation of graduates with sufficient twenty-first century skills is inadequate, especially where graduates are competing not only with others in their graduating class but also with graduates across their respective country and the entire Asia Pacific region and beyond. 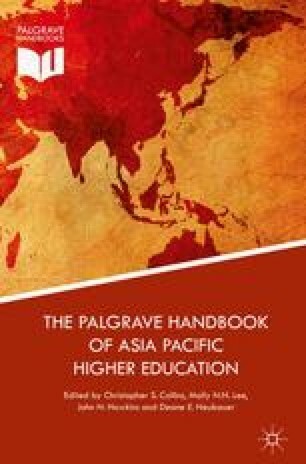 In this chapter, we examine the important and dynamic roles equity, efficiency, choice, and excellence play in the current higher education capacity-building scene in the Asia Pacific region. Brief country case study examples are provided on Bangladesh, China, Fiji, India, Indonesia, and Korea. Bangladesh Bureau of Educational Information & Statistics (BANBEIS). 2014. Bangladesh education statistics 2014. Dhaka: BANBEIS. http://banbeis.gov.bd/data/index.php. Accessed 11 Sept 2015. Jacob, J., S.E. Sutin, J.C. Weidman, and J.L. Yeager. (eds.) 2015 Community engagement in higher education—Policy reforms and practice. Pittsburgh studies in comparative and international education Volume 3. Pittscburgh: Institute for International Studies in Education. https://www.sensepublishers.com/media/2337-community-engagement-in-higher-education.pdf.